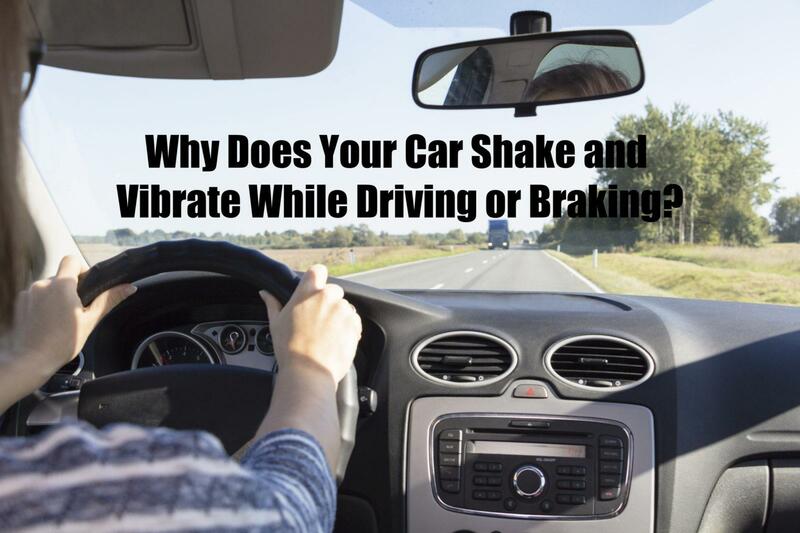 Why Does Your Car Shake and Vibrate While Driving or Braking? A car that vibrates or shakes while driving needs a closer inspection. You might experience the vibrating movement either while driving, when you apply the brakes, or even when the car is idle. Or maybe in all three of those circumstances! In most instances, the issue is not a serious problem with the engine. Instead, it could be because of tire balancing, a bad engine mount, or worn suspension parts. Sometimes the vibration might settle down and go away. However, if the shaking or vibrations get stronger and more intense, then it could be due to one of the following reasons. Tires are typically balanced at the time of installation. However, if you suspect a tire balancing issue, then consult with your mechanic right away. A professional mechanic will use a special machine to inspect and ensure the weight of the wheels is balanced perfectly all the way around. Most car vibrations can be easily fixed by having the tires balanced. If the wheels are unbalanced, even with a tiny weight difference, you will feel vibrations. If this condition is not addressed, it could also cause premature wear and tear of the tires. The engine mount plays a very important role in ensuring your car runs smoothly. In addition to connecting your car’s engine with the car body, the mount also links the transmission to the car body. Furthermore, it is the mount which is responsible for absorbing any shocks or vibrations that are generated while the car is in motion. Any time the mount sustains damage, or becomes worn out, it will fail in absorbing the shocks and vibrations. This, in turn, could lead the entire body of your car to shake. Tire treads provide grip, so your car has the necessary traction and stability while speeding up, turning, as well as slowing down or braking. However, because the tires are continuously spinning, and because they are constantly in contact with the road surface, they tend to wear out and become flat. If the tire treads get worn out, the car will start to shake and vibrate. You will notice the vibrations tend to get stronger as you accelerate. The only way to resolve this issue is by replacing the worn-out tires with new tires. Wheel bearings allow the wheels to spin freely while also providing a mount to the car. Any time the wheel bearings become loose or worn out, the car will start to shake and vibrate. Since the vibrations are generated from the wheels, the car will become less stable driving at any speed. This can be extremely dangerous. In certain cars the wheel bearing can be adjusted. A professional mechanic will be able to easily help you with this. If the wheel bearing is mounted on the hub of the wheel and the hub has play, then the part will have to be replaced. Sometimes the shaking and vibrations you experience could also be caused by your car’s brakes. Especially if you’re feeling those vibrations when you decelerate. If the brake rotors or the brake drums are not perfectly flat, it can cause brake pulsation. Any time the brake pads push against the rotor, their ability to apply constant, continuous pressure is diminished. This can lead to a sudden vibration in the car, which will reduce in intensity when the car starts decelerating and comes to a complete stop. Brake pulsation will effectively extend the distance it takes to bring your car to a halt and can even limit the control you have over your vehicle. Any issue or problem which involves the brake should never be ignored since it is a matter of your safety. Consult with a professional mechanic as soon as possible. Driving a shaking or vibrating car can be very frustrating. More importantly, if the vibration is caused due to a major component, like the braking system, the danger only increases. Even if the shaking is not consistent and it comes and goes, it is best to have your car checked by a professional mechanic. Are you worried about your car vibrating and shaking while driving or braking? We can help. Call Virginia Auto Service today at 602-266-0200 or schedule a visit with us online at your convenience.